To know how people moved around the hotel, identify queues, identify lost opportunities and optimize their workforce to boost client satisfaction. 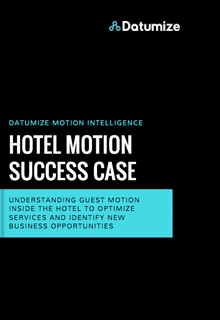 Using the hotel’s existing wifi infrastructure, Datumize was able to capture data from different systems to understand how guests and workers move around the premises. This new data has been used to identify hidden business opportunities such as cross-selling for ancillary services depending on customer location patterns.